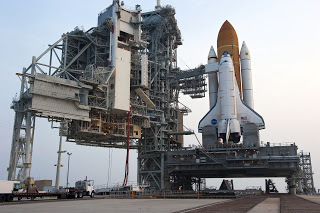 As it stands right now, the final ever space space shuttle launch (of orbiter Atlantis) is scheduled to take place this coming Friday, July 8th. Atlantis is scheduled to launch at 11:26 AM Eastern Time. I am going on a road trip with one of my buddies to Titusville to see STS-135 launch, and I couldn’t be more excited, or nervous – because an estimated one million plus people are supposed to be there, and plus parking and other amenities will probably be catastrophic at best. We’re leaving the night before (we’re not too far out) and we’re camping because hell to the no we aren’t spending upwards of $300 on now non-existent hotel rooms. I have no idea how the whole thing is going to turn out, but I’ve had good luck – knock on wood – with previous shuttle launches. So we’ll see how it goes. Also, there is always a chance of possible delays. That will just give us a chance to geek out at the Space Walk of Fame Museum, though, which is never a bad thing. Seeing Gus Grissom’s Gemini 3 post-flight jumpsuit always brings a thrill…if you, dear reader, get a chance to visit Titusville, Florida, you MUST visit this spectacular place. For STS-135’s launch countdown milestones and approximate times, check out this NASA link. Also, if you’re driving out like we are, here are some handy dandy traffic tips. 1981 NASA photo. 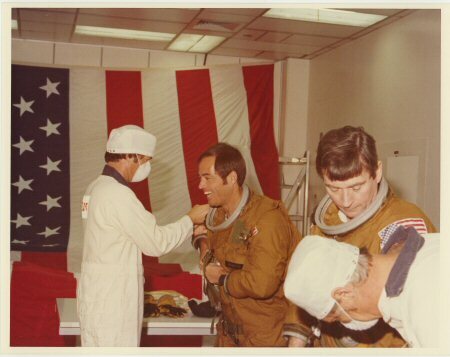 From left, suit technician, pilot Bob Crippen, and mission commander John Young.